It literally took almost a full year to accomplish, but I finally brought the unconfirmed anime list down to zero. This time last year, there were over 1,400 anime series that hadn't been confirmed yet, and thus users were unable to upload videos that used them. This massive backlog of anime (a large portion being duplicate entries), prevented moderators from efficiently confirming them as they came in, and so the Official: Anime Confirmation Requests thread was made to alleviate the effects of this problem. But now, all the entries in the anime database have been either confirmed or denied, and we've already begun phase 2 of the improvement process. For phase 2, I'm going through the entire list of confirmed anime and reducing the amount of redundancy and inconsistencies. I already did this for a few of the most popular series like Pokemon, but I know that there are still a lot of errors and double entries throughout. 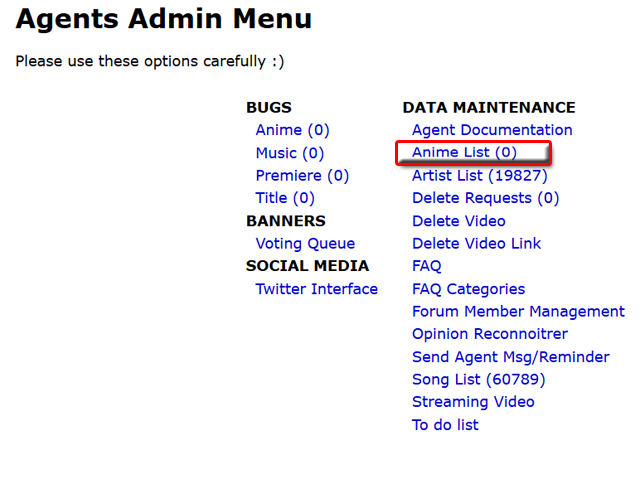 Hopefully I'll be able to finish updating the anime catalog by the summer. Also, I will now be preemptively adding anime titles to the database as they begin airing. And so if you're editing with a show that is currently airing, or has recently finished, it should already be confirmed. The addition of each season's upcoming anime will coincide with the update of the Seasonal Anime Index and the creation of its individual Anime Discussion threads.